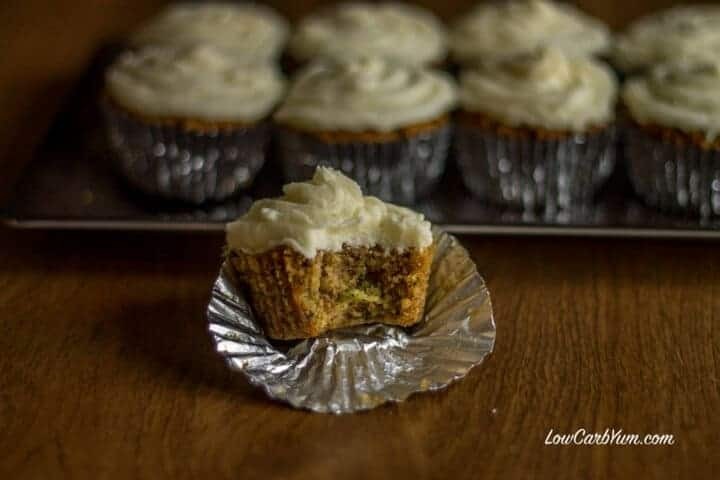 Moist and flavorful low carb zucchini spice cake cupcakes are gluten free with no sugar added. Each is topped with a sugar free cream cheese frosting. I was at a small grocery store in the next town over buying a birthday cake for my husband. The bakery in that store is directly across from the produce. 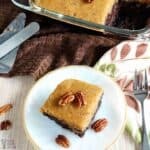 As I was waiting for the lady to customize the cake, I turned and got a glance of some lovely zucchini and the idea hit me to make myself a low carb spice cake out of zucchini. 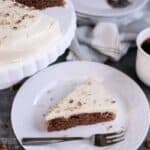 Carrot cake is a favorite of mine and I have not yet attempted a sugar free one, but I knew I could achieve a similar taste using zucchini. All of the baked goods I’ve made in the past with zucchini have come out moist so I was eager to try a gluten free zucchini cake. 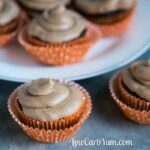 I looked at several recipes for zucchini spice cake to come up with a recipe for these low carb spice cake cupcakes. To make the cake gluten free, I used a mix of almond flour and coconut flour. 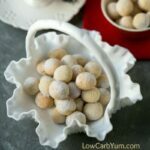 It’s best to sift the almond and coconut flour before using in baked goods to get out any lumps. Below is a picture of the flour and spice mixture. The texture isn’t far off from what a regular flour mix would look like since the low carb flours were sifted first. 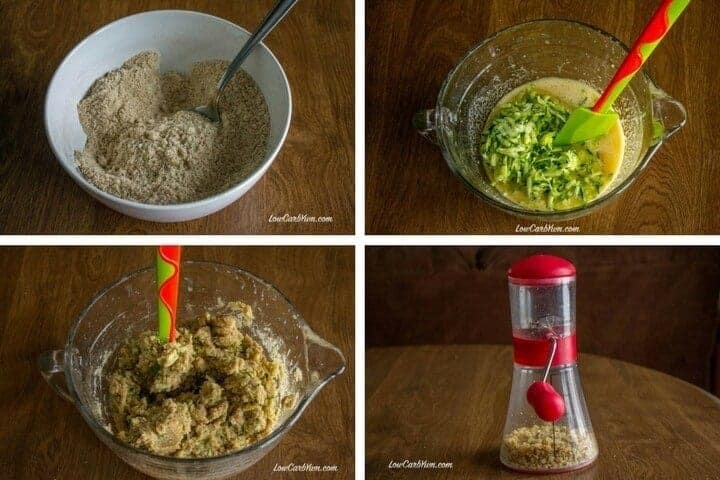 The grated zucchini is mixed in with the liquids just before adding the flour mixture. I used one small zucchini which yielded about one and a half cups of packed grated zucchini. 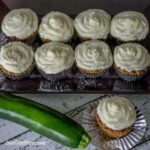 This zucchini spice cake cupcakes recipe gave me an opportunity to use my new favorite kitchen gadget, a nut chopper. I’m not sure how I got by all these years without having this nifty tool. It’s so much better than the Pampered Chef manual food chopper that I used to use which was way more expensive. The cupcake batter gets really thick after adding the flour mixture. This is because the coconut flour absorbs so much liquid. I debated whether or should add more liquid at this point, but decided to keep it as is. The reason was that my garlic coconut flour bagel batter was similar and those came out just fine after baking. Because the batter was so thick, I needed to press it into each cupcake liner. I used chopped walnuts so if you choose to leave the nuts out, the batter may not fill up each liner quite as much. Although you don’t have to, I find smoothing out the tops with your finger or the back of a spoon will give a nicer looking top after baked. When the zucchini spice cake cupcakes begin to brown and firm up is when you want to take them out of the oven. For me, this was about 25-30 minutes of baking. The cupcakes are pretty delicious as-is without the sugar free cream cheese frosting (basically muffins). So go ahead and leave them unfrosted if you’d like to cut back on calories. 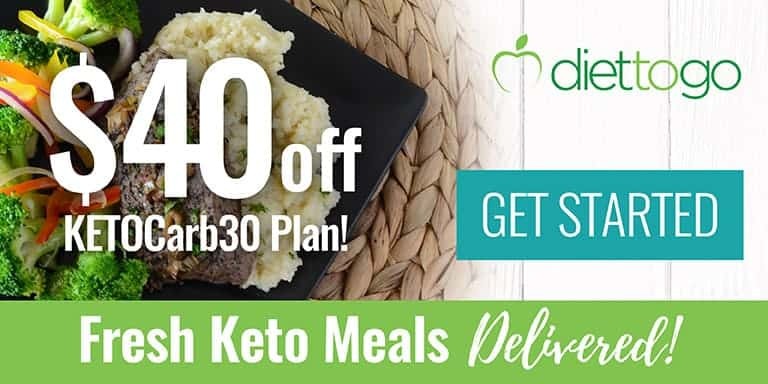 Adding the low carb cream cheese frosting adds no additional net carbs because you can subtract the sugar alcohol erythritol which isn’t digestible. You can always cut back on the frosting or only frost half the cupcakes. 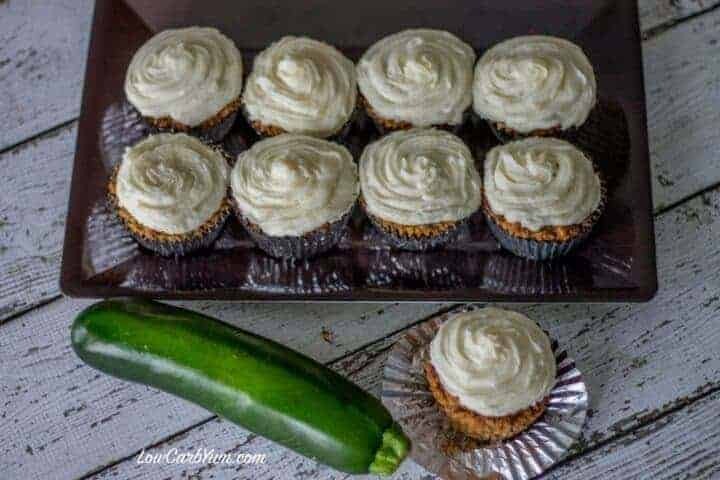 You can pass these yummy spiced zucchini cupcakes off to your non-lowcarbing friends and family. I guarantee they will eat them up without complaints with or without frosting. 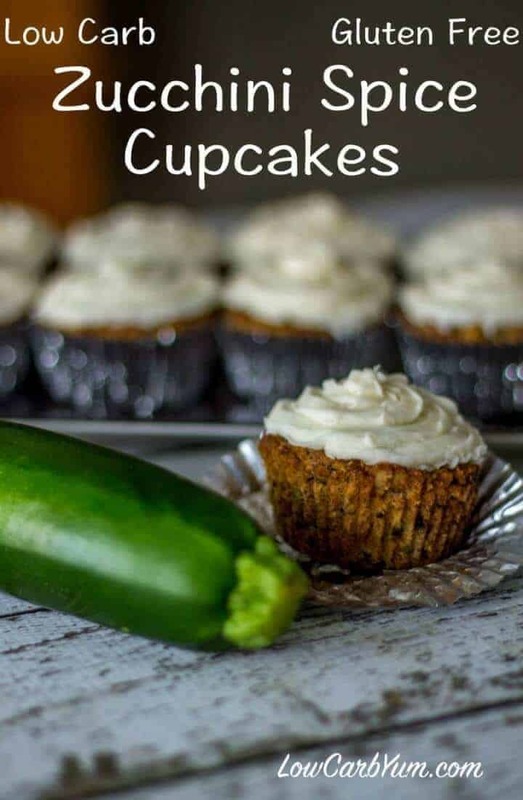 Although zucchini spice cupcakes are something I’d typically make in the summer while we are getting zucchini fresh out of the garden, there is no reason not to make these delicious mini cakes in the middle of winter. You could easily bake this into a delicious spice cake instead of cupcakes. I don’t have the baking times for baking this cake in a 9-inch round, but it would likely be about 10 minutes more. To make a double layer 9-inch cake, you’ll want to double this recipe. 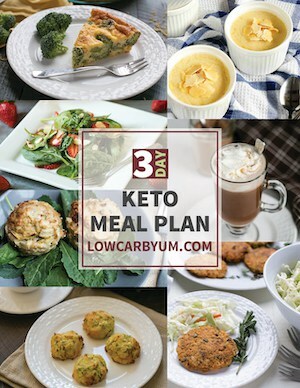 Doubling the recipe would also produce enough batter for a 9×13-inch baking pan sheet cake. These cupcakes are absolutely delicious! 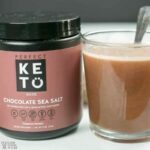 The low carb sweetener has only a very slight coolness from the erythritol and no bitter aftertaste when the right amount is used. 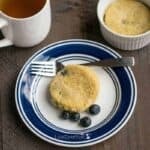 I found that if you accidentally add too much of any stevia sweetener, you will get a nasty aftertaste so it’s best to be light on the sweetener and add a little at a time until you get the right amount. Otherwise, you’ll have to dilute the sweetness by adding more of the other ingredients. 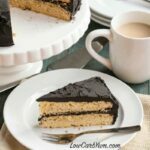 For those who prefer a chocolate, be sure to check out my low carb chocolate cake. 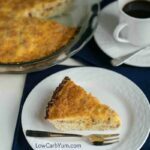 Grated zucchini is the secret to making all your low carb cakes moist and spongy when using coconut flour! 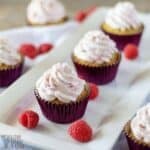 These spice cupcakes are sugar free, low carb, and gluten free. The moist zucchini cake is topped with a stevia sweetened cream cheese frosting. 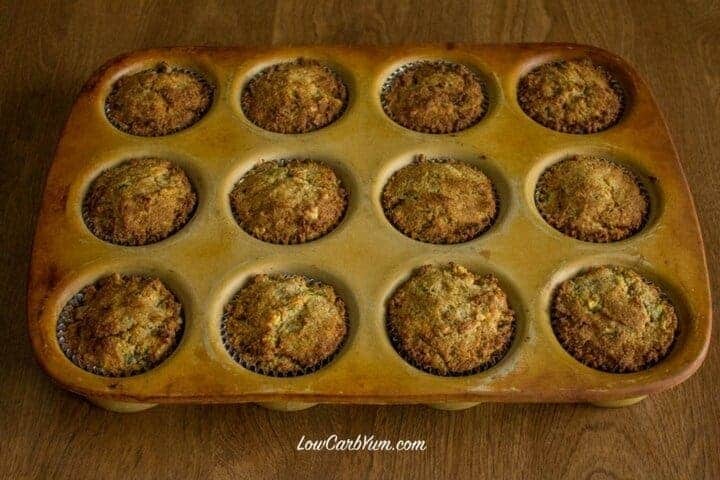 Line muffin tins with 12 paper or foil liners. Stir together almond flour, coconut flour, xanthan gum, baking soda, baking powder, salt, cinnamon, nutmeg and cloves in medium bowl. Set aside. In large mixing bowl, whisk together coconut oil, eggs, and vanilla extract. Stir in zucchini and Natvia sweetenr, then add flour mixture and stir until combined. Stir in walnuts if using. 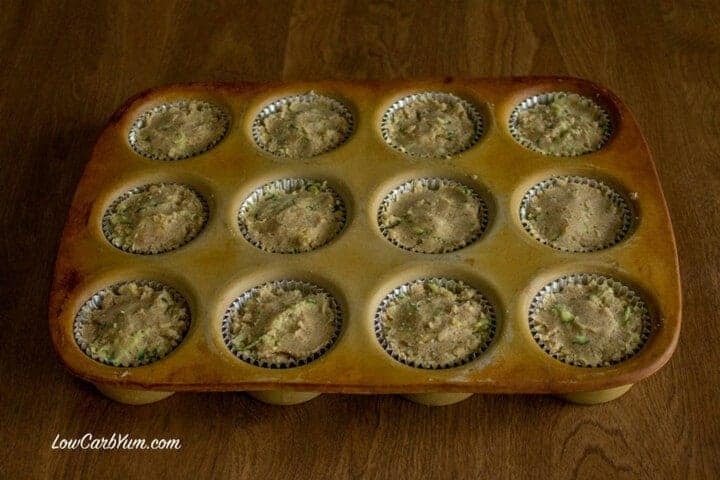 Press batter evenly among cupcake liners. Smooth tops if necessary. Bake at 350°F for 25 to 30 minutes until browned on top and cake is firm to touch. Remove from oven and allow to cool on cooling rack. Frost with cream cheese frosting if desired. Store cupcakes in refrigerator or freezer. Allow to come to room temperature before serving. Powder the Natvia sweetener in NutriBullet type blender or a food processor. 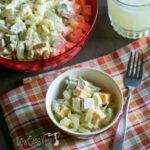 With electric mixer, beat together cream cheese and butter until well combined. Add powdered Natvia and whip into cream cheese mixture until light and fluffy.